ROGER COX – IS REVOLUTION JUSTIFIED? Despite the spring misery in Eastern North America – world heat records continue to tumble. Ice is melting faster at both poles. We’re in trouble, but world leaders are preoccupied with getting elected – or hiding money in Panamanian corporations. If governments fail our children’s future, is revolution justified? That’s the question raised by Roger Cox, a prominent green lawyer in the Netherlands. He’s not calling for crowds in the street, but real justice. Cox sued the Dutch government for failing to protect the future, and won. That’s spreading all over Europe, Canada, New Zealand, and into the United States. Hear Roger Cox explain how it’s done. Who is this revolutionary? In the Netherlands, Roger Cox is partner at the law firm Paulussen Advocaten. He is the power-house lawyer who sued the Dutch government, demanding a 25% cut in greenhouse gas emissions by 2020. He won, setting a precedent for people around the world, and we’ll talk about that. He founded the “Planet Prosperity Foundation” promoting a circular economy. And Roger is known in Europe as a leader in sustainable real estate development, something almost unknown in North America. Roger Cox is also a CIGI senior fellow with the International Law Research Program. The Centre for International Governance Innovation (CIGI) is an independent, non-partisan think tank on international governance. My thanks to CIGI for helping to arrange this interview. Roger was central to a lawsuit against the government of the Netherlands. The Plaintiffs were the environmental advocacy group Urgenda Foundation, and 900 individuals. Essentially they argued that the poor legislation for emissions reductions by the Dutch government endangered future generations. They won the lawsuit and the government had to enact requirements for bigger emissions cuts, much sooner. The Dutch government agreed to cut greenhouse gas emissions by at least 25 percent by 2020 (compared with 1990 levels). This set an international precedent which is growing into a movement. A similar lawsuit has been launched in Belgium, and another is pending in New Zealand. Other lawsuits are being considered in Canada, Italy, Ireland, the United Kingdom, and France. The French action follows one legal victory there in June 2015. The idea begun by Roger, that citizens can sue their governments on behalf of the children, is now being tested in a U.S. Court. See this article on Alternet, and this piece from Australia. The Oregon-based “Our Childrens’ Trust Foundation” has launched a climate lawsuit in the United States. That suit is led by none other than Dr. James Hansen, along with 21 young people, many of them teens. In another case, launched by the State of Massachusetts versus the EPA, the Supreme Court has already “in effect” ruled that climate change is real and dangerous, Cox tells us. IS A “REVOLUTION” IN THE COURTS ENOUGH? Of course, waiting for a break in the U.S. Supreme Court (depending on who gets nominated) might take too long to avert disaster. I have to ask Roger, and you as listeners, would a violent overthrow ever be justified? Let’s say the Arctic sea ice disappears, and the northern Hemisphere is hit by years of unrelenting storms and heat waves. Crops fail. If governments fail to respond, should we go down quietly? I doubt people will just go along with business as usual, once they see the impacts of an abrupt climate shift. We’re not quite there yet, maybe (see the next interview with Paul Beckwith). It can’t hurt to have all lawyers, judges – the whole legal community – become aware of the threats posed by climate change. Roger tells us that local judges, and some state courts, are already moving in the direction of taking climate safety as a real legal issue. Roger tells us all industrialized countries signed into an international law to protect the climate at the 2010 Climate summit in Cancun Mexico. A few countries, including Germany and Denmark, have followed up, enshrining this protection into law. Knowingly breaching the 2 degree C “safe limit” would also be an infringement of human rights, as laid out in various United Nations binding agreements. More legal safeguards were added at the COP-21 climate summit in December, 2015, Paris. There are a lot of international laws, which your government likely agreed to, that lawyers can use to push the government to act on greenhouse gas emissions. One of our regular guests, scientist Paul Beckwith from the University of Ottawa, is warning anyone who will listen that we are in a global climate emergency. Forget 2050 or even 2030. Abrupt climate change has arrived, Beckwith says. Paul has two Masters Degrees. He teaches climate science at the University of Ottawa, while working on his own Doctorate – on the subject of abrupt climate change. Paul is a scientists-activist, with a busy You tube channel, Facebook community, and more – all found on his new web site, paulbeckwith.net. When I checked last, his new video and article is titled “My Condolences to Australia’s Great Barrier Reef” (April 3rd). In this program, I run a slightly edited audio version from Paul’s important You tube video “Chat on our ABRUPT climate change EMERGENCY“. This just has to get out there, and I’m happy to offer Radio Ecoshock as another way to express how serious our situation really is. – from Paul Beckwith’s web site. We wrap up with an intriguing visit with a specialist in the story of glaciers and ancient climates. Before the 10,000 years of stable climate our civilization grew up in, the great glaciers came and went. The climate shifted with them, sometimes warming as much as 5 degrees Centigrade within 50 years. It’s a tough field to understand, and harder still to figure out what applies to climate change today, and what does not. Some climate deniers have played on that confusion. But the science of past deglaciation is getting better and better. A new paper out from a team of scientists from the United States, Britain, and New Zealand almost crushed my skull with problems. I wrote the lead author, Thomas K. Bauska with my beginner’s questions, and he patiently schooled me in patterns of climate change I did not know. That’s why we called on Thomas for Radio Ecoshock. 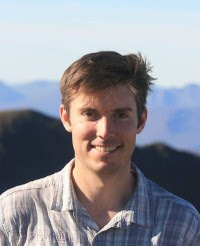 Educated in Chicago, with a Ph.D in Geology from Oregon State, Dr. Bauska is currently a researcher with the Department of Earth Sciences at the University of Cambridge in Britain. The paper that stimulated this discussion is titled “Carbon isotopes characterize rapid changes in atmospheric carbon dioxide during the last deglaciation.” It was just published in the prestigious Proceedings of the National Academy of Sciences, or PNAS. As a non-scientist, my first surprise reading this paper was that deglaciation can cause a rise in CO2, and not the other way around. About ten years ago, people denied carbon dioxide was warming the planet. They jumped on the science of glaciology, to produce the argument summarized as “CO2 doesn’t lead, it lags.” Can carbon levels rise AFTER a warming, and if so, what caused the initial warming? Talking about this, Thomas referred me to a 2012 paper published in the journal Nature by Shakun et al. The title is “Global warming preceded by increasing carbon dioxide concentrations during the last deglaciation.” You can read that full article (as an online .pdf) here. As I understand it, the point is this: past climate shifts began with geophysical forces: things like the 100,000 year cycle where the Earth’s orbit tilts toward or away from the Sun (a bit). That can start a warming, which then releases carbon dioxide (and methane!) – which becomes a positive feedback effect, increasing the warming much more. Contrarians argue other forces, like a tilt of the Earth’s axis, can cause warming, so carbon dioxide isn’t causing warming today. That is so simplistic it’s silly. A second discussion in this paper seemed familiar to me. That was about changes in ocean currents, as deglaciation developed. We have just seen a giant cold spot appear in the seas south of Greenland, big enough it is thought to be altering the winter weather in Britain. I wouldn’t want to leave listeners with the impression that abrupt climate changes only happened as ice ages ended, and cannot happen now. I have spoken with scientists like paleontologist Peter Ward and Ottawa’s Paul Beckwith who assure me there are records of abrupt warming, even from relatively warm starting points. ARE WE EXPERIENCING “DEGLACIATION” NOW? “One interesting question that I wasn’t able to answer fully is whether we are currently in a “deglaciation” or not. My gut reaction was to say “not really” because the projected sea level rise over the next century is an order of magnitude less than the last transition from the ice age. However, this paper really changed my view of future sea level rise. The authors (colleagues from Oregon State) take a long view and project sea level and temperature changes over the next 10,000 years (rather than the next few hundred). For context the compare the past 20,000 years, essentially the last deglaciation and Holocene. This is perhaps the long-term, geologic perspective that the deglaciation that your audience might gain insight from. I’m still working with my team on a classy new web site and blog (combined) for Radio Ecoshock. It will have a much better search function, so you can find the scientist or author you want to hear from. Plus, the new design will really work for all the folks who reach out to Radio Ecoshock by phone or tablet. The new blog will also be compatible with Itunes, so we can raise the number of podcast listeners. I’ll let you know as soon as it arrives. Also, to help get the message out through video, I’m experimenting with a short (3 minutes or less) series of videos with the working title “This week on Radio Ecoshock”. I’m hoping people will share these with social media, to raise climate awareness. Please do. If you feel you can afford to support my work on this program, please either make a one-time donation, or sign up for the $10 a month subscriber status, from this page. Thank you for listening again this week, and caring about our world. I warned you about Paul Beckwith's geo-engineering fetish, now he's made a video promoting the detonation of nuclear bombs over the desert. Question firstly to Roger Cox. From listening to the interview it seems that we might be able to hold Governments to account over the 2020 targets since they're legally binding, which is great. But what about beyond 2020, say 2030 or even 2050? We all know 2020 targets are from adequate and presumably Governments around the world do since (my impression at least) is that COP agreements (based on Paris) will no longer be legally binding. Also, to me that explains why in the UK, Ed Milliband's alliance to make the Paris agreement legally binding is floundering. No Government will sign anything as its obvious they're failing their judiciary duty horrendously for fear of imprisonment. Roger, what legal recourse do we have beyond 2020? Could you please explain why this is so or if I'm completely misinterpreting your comments please let me know. Thirdly with regard to Paul Beckwith and H bombs. This may be controversial – and welcome comment – but his suggestion seems plausible. Assuming we do nothing (or carry on as we are) many people will die and increasingly so in the future. Ideally we need to reduce emissions to zero, be carbon negative and stop runaway climate change (in other words cool the artic). Plus restore the eco systems and so on (the list is long I know). Is how the timeframe of the proposed solutions completely mismatch with the urgency of the problem. I'm left with the impression that our collective social conversation is unwilling to entertain what phrases like "leaving fossil fuels in the ground" right now really means. Let me ask if I dropped a H Bomb now which, by orders of magnitude, reduced deaths from climate change now and into the future would I be a monster? I'm not sure what my answer would be unless anyone has any ideas of stopping the climate going crazy right now and save more people right now? Changing the question a bit, imagine I waved my magic wand (which took 100 years) and was left with a carbon free economy with vibrant eco systems and C02 back to preindustrial levels but as a result 1 billion people died until my magic worked. I rewind time, perform my magic again but instead I also drop a H Bomb every 10 years and this time 'only' 0.25 billion people died. Am I a monster? Is the idea still silly? Thoughts?